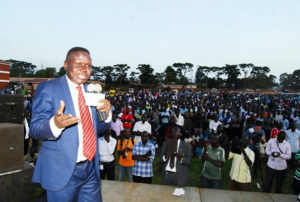 DP president Nobert Mao addressing supporters at a past event. Courtesy photo. Kampala: Democratic Party president Norbert Mao warnings about the dangers which lie in wait for the ruling party over its contested plans for privately owned land will have probably haunted the dreams of a senior minister on Thursday night. Dr Chris Baryomunsi the state minister for housing appeared on late night television where Mao issued his dark prophesy. He told viewers on the NBS television’s Frontline talkshow that Dr Baryomunsi and his colleagues in government will do well to learn from the unhappy lessons which were dealt to former premier Amama Mbabazi. While in government, Mbabazi had been a very enthusiastic architect of the much-derided Public Order Management Act. He became one of the first victims of the law shortly after he was jettisoned from Cabinet and joined opposition ranks. The Act, to this day, is considered by many to be an unconstitutional restriction on civil and other liberties as they are universally recognised in as far as the protection of freedom of assembly and the right to associate freely, among others, is concerned. On the Frontline, Mao pointed out that a number of National Resistance Movement honchos can be found amongst the biggest property owners in the country. These rich folk could easily find themselves suffering under the proposed changes in the land law. “Most of the bitterest conflicts in the world have been about land. The issue of land needs to be handled carefully,” Mao said. There is already significant public outrage over the reported plans to give the government rights to compensate after, not before, forceful acquisition of private land. The debate promises to get even more involved in coming days. The minister never impressed Mao and the other panelists with spirited protestations about the government’s intentions in wanting to get rid of Article 26(2) of the Constitution – to purportedly make it easier to acquire land for development projects. That Article guarantees the right to private ownership of property. It also provides for appropriate compensation prior to forceful acquisition of private land for public use. Dr Baryomunsi said that the government wants to do is to stop individuals who have been unreasonably standing in the way of development projects. The government, he said, will not tamper with the Article in regard to fair and adequate compensation before taking private land for development. “Government has no intention to grab people’s land. What we are saying is that in case the land owner turns down the price set by the government valuer, the government can deposit the money in court and negotiations go on as government continues with the development programmes,” Dr Baryomunsi said. But Mohammed Nsereko, the Member of Parliament for Kampala Central promptly reminded viewers that Article 26 was enshrined in the Constitution to protect the poor from land grabbers. He said a government valuer cannot be relied upon to make a proper determination in the interest of a private citizen because he can be influenced by a phone call [from up on high]. The studio was fully alive with the ghosts of looming violence over land disputes wafting about. Former Ethics minister Dr Miria Matembe said there was no need to change the land law, arguing that the Constituent Assembly, which she participated in, conclusively debated the issue of land. 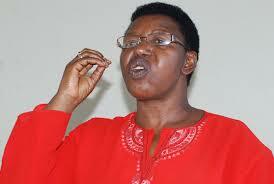 “There are three controversial issues that dominated the Constituent Assembly and they include the issue of land, multi-party politics and federalism [for Buganda sub-region], but the issue of land was more pronounced because it affected everybody,” Matembe said, adding that people should never be bought like one buys pancakes. Tabled in Parliament by Deputy Attorney General Mwesigwa Rukutana on July 13, the Land Amendment Bill, 2017 seeks to give government and local government powers to compulsorily acquire private land in public interest to execute infrastructural and investment projects. The bill seeks to amend Article 26 of the 1995 Constitution that provides for the right of people to own property and how government can acquire the said property. It states that every person has a right to own property either individually or in association with others. It provides that no person shall be deprived of property except where the acquisition of the said property is necessary for public use, public safety and public order or where the taking over of the property is made under the law in which it will call for prompt compensation before the property is taken.